The 211th release on Deepsessions is out this week and it sees the debut of Richard Knight to the label. This will be Richard’s first release of 2013 after a couple of nice outings on Slumberjack and Pretty Neat Records in 2012. 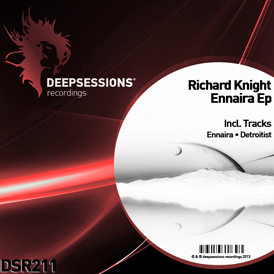 Richard’s first EP for Deepsessions is entitled ‘Ennaira’ and it comes with two brand new original productions. The title track gets the release underway with an up-tempo groove that’s surrounded with deep, atmospheric backdrop. Subtle vocal gates and big gated sweeps add some nice texture as the drums begin to build and the track really starts rocking. A short drop introduces a trancy lead which pushes the track forward with some amazing melodic energy. As the track strips itself down just briefly a second hypnotic lead comes to the forefront through the centre section of the record for even more energy. Both ideas here are amazing and provide a huge peak time type vibe which should go down really well on the trancier dance floors out there. The companion piece ‘Detroitist’ comes with an altogether different vibe as it’s got much more of a techno sensibility. A hoover style bass line combined with punishing beats and nasally sounds provide a big energetic drive that should send old school techno dance floors into a frenzy. A nice varied release from Deepsessions with ‘Ennaira’ really hitting the spot with its great melodic energy.